TALENT: Justice Crew steps out in Geelong next week. JUSTICE Crew might spur the next dance-move craze following the well-publicised Miley Cyrus twerking episode of last year. Member John Pearce told the Independent the group was incorporating into its gigs some audience participation, teaching the group’s unique moves to fans. “We’ve got to invent our own little twerk or style that gets people to try and copy it,” he said. “We try to get people up on stage and play games with the crowd. We might have a screen with different dance moves, like twerking and crumping. But the six guys in the crew were a little careful about who they picked to join them on stage, with plenty of hysterical fans in the audience. “It’s been pretty well-behaved but some people run up to their favourite and hug them and won’t let go,” Pearce laughed. Four years on from the group’s big victory on Australia’s Got Talent, Pearce said Justice Crew never expected to reach such heights. Diversifying from its beginnings as a dance crew into singing, rapping and even songwriting, four of the group’s singles have sold more than double platinum, including ARIA number one Boom Boom, which achieved platinum more than six times. The group’s quest to achieve number one across the Pacific has begun since signing with American record label 305. Daily morning rehearsals followed by calisthenics training or gym work and vocal coaching were now part of the Justice Crew lifestyle, then travelling to tour on the weekends, Pearce revealed. “After Australia’s Got Talent I thought, ‘Where will we be in five years’ time?’ and I had no idea. The guys will shortly release a new single from their upcoming EP and are planning an album for the end of the year. 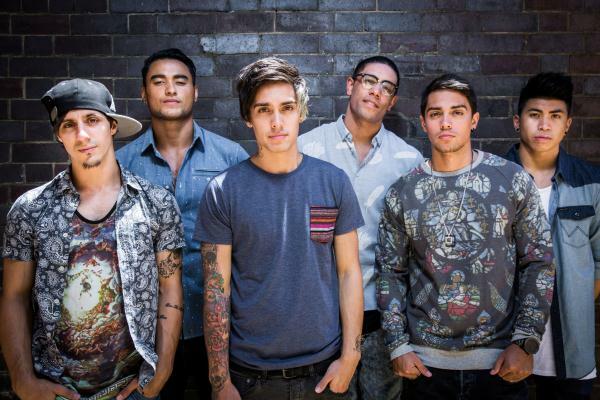 Justice Crew plays Geelong Arena with Jai Waetford as support on 19 April.